Liddy B. and me: W.O.W. Wednesday: Thrifty is NIFTY! W.O.W. Wednesday: Thrifty is NIFTY! First, I am amazed that this post is happening on time! I had NO idea how difficult it could be to keep a regular blogging commitment, like Words of Wisdom Wednesdays! 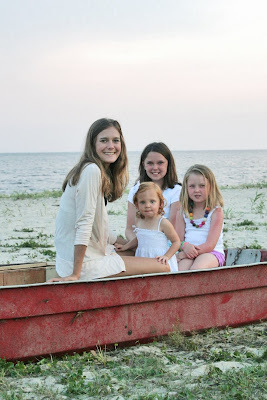 I am starting to understand the appeal of a WORDLESS Wednesday!!! We have been sick, AGAIN, this week. Mostly just me with a bad cold this time around. Thankfully, PJ has been up for dealing with groceries and some extra Lydia duty AND I am off work next week to get all better and all caught up. SO, with that out of the way... today is dedicated to my LOVE of all things thrifted!!! First, Let's talk about color. My favorite thrift shops aren't organized much, so I am drawn to the color of clothing first. I have always been weird about "baby colors" on baby cloths. I don't mind pink, but that pale baby girl pink that is on EVERYTHING for baby girls, gets on my nerves. 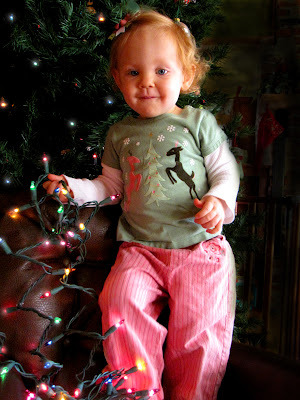 When Lydia was small, I jumped for ANYTHING in colors that I thought looked good on a red head. That's tip #1 no matter HOW much you spend on clothing, for yourself or your kid, figure out what colors look good on you and stay in that range. I can usually do OK with this rule........until the holidays. I keep finding cute Christmas and valentines shirts and then I can never make them work on Lydia because they are red and that just isn't one of her colors. I don't really have a problem with red, but nothing else she has really matches it. However, if I focus on a few colors that DO look good (fall colors, rich jewel tones, green, turquoise, brown) then no matter what I buy, in whatever sizes I find, it almost always comes together to make an outfit, even if the pieces were bought years apart at several different thrift stores. So now I try to find pieces, even holiday pieces like the light green and pink shirt above, that fit Lydia's color scheme. So, remember that first top, it's a size 3T! When I bought it, I planned on setting it aside for a few years. I have big plastic bins organized by season and size that are FULL of clothing just waiting to be worn. That is tip # 2 for thrifting. Size doesn't matter! If it is a great style, pattern, color, fabric and price but too big, you can save it for a few years. I try not to buy more than 2 years ahead and I try not to get anything too trendy. I shoot for a little bit vintage and a little bit classic kid, and LOTS of embellishment. I am aware that eventually Lydia will have an opinion about the matter and I am trying to limit the advanced buying a little. I have developed a pretty good system of selecting staples. I always buy bottoms (shorts, pants, or skirts) in brown, khaki, olive green, denim, and often purple and fuchsia. Tops are usually patterned and in colors that work with those bottom colors. Since the bottom colors are always the same, shopping for tops at the thrift store becomes much easier. I never mind if I have too many tops, since they usually get dirty. However, I tend to buy WAY to many dresses. I am trying to get that impulse under control. 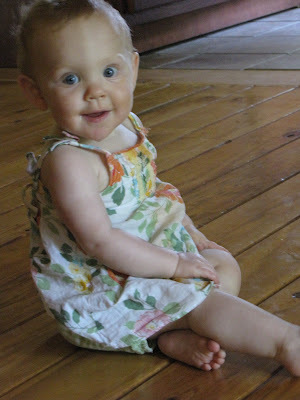 I realize Lydia really only wears dresses to church, so more than a handful and they go to waste. I have decided one summer staple is to look for a simple white dress each year for wearing at the beach. I think every beach trip needs a picture that includes a white dress on the beach . The white dress in the above pictures was another $1-$2 buy. Because it is just elastic with string straps, it can also be worn for a while. That's tip #3. What starts out as a dress, can become a long shirt and then a regular shirt as long as it is the right shape. 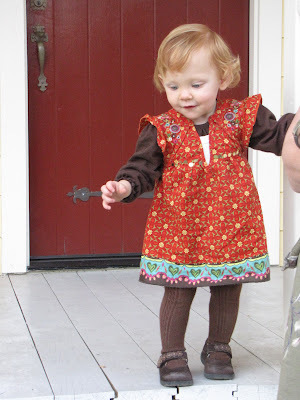 So that elastic band dress is easy, but only works as a summer dress. If I can find something sleeveless, but not too thin or summerish, like the "dress" above it can work for almost any weather depending on what is under it. I found this shirt on sale for $3 at The Children's Place (Score!) I LOVE, LOVE, LOVE the color and the style of it. I bought it in a size 3 on purpose. 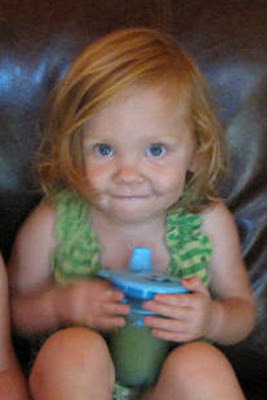 With a few nips and tucks, she wore it as a dress at 18 months and as a long shirt at 2 years. She will get at least one more fall out of it and then I can sell it at consignment! OK, so tip #4 might not be for everyone. I will often alter thrifted cloths. Some items are easier than others. 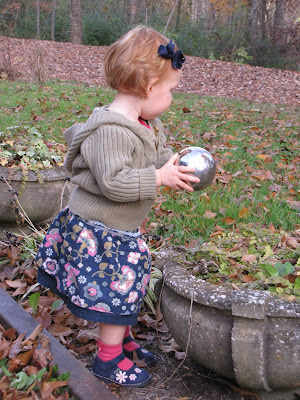 Skirts, like this one can be taken in quickly by just overlapping a small flap and sewing it in place. I love the pattern on this skirt and then when I found those shoes, I just HAD to make the skirt small enough to fit her while the shoes still did! Pants can be shortened, but that is usually permanent (as I think rolling the cuffs looks bad) but if the length is OK, you can make the waist smaller the same way. Shirts can be harder to alter. If there are pleats on the front, I often add an extra pleat or two to shrink the width. I have learned a few more tricks, but you have to have a pretty good feeling for clothing construction, so I will stop there for now. Tip #5 is related to size doesn't matter. Tip #5 is size may be deceiving. Because thrift store clothing has been washed it may have shrunk. In fact, that may be why it was thrifted in the first place. Lydia has a pair of size 4 pants (Gymboree) that fit around age 2, but are too short now. Thankfully they had an adjustable elastic waist, but you have to ignore the size on the tag and go with what fits. The sweater above is a beautiful, hand knit, wool sweater imported from Ireland. It doesn't have a size on the tag, but it looks like an adult small that shrank. 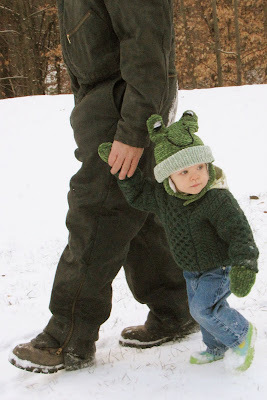 Of course that only made the knit tighter and more perfect for Lydia to wear in the snow last year. Here is one last thrifted favorite, the Gymboree strawberry shirt. It is a size 4, but was designed with elastic in the armholes and neck so that it gathers a little. That also means it looks smaller in those areas. 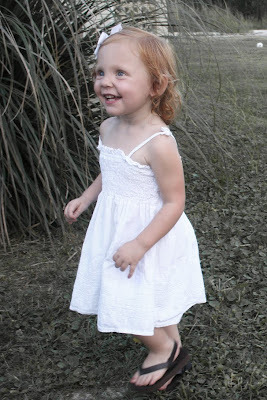 So Lydia wore it at 1 and 2 years old with white pants or white shorts. It will still fit this summer (and probably next) and I am really excited because I just found a really cute pair of white pants (at the thrift store) with little embroidered strawberries on them that will be perfect for year 3! Here's hoping Lydia will eventually be as excited about these finds as I am. W.O.W. Wednesday: Closet Clean Up! Let the Party Planning BEGIN.....again! Have you heard about Henry?